Situation in Belarus after “the convincing victory”: second issue of the comics newspaper. 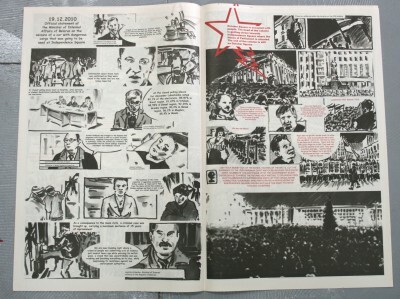 The 12 pages of the continued political comics illustrate how the situation unwound in Belarus after the presidential elections in December 2010. All the latest developments – i.e. political repressions, balance-of-payments and economic crises, a bomb attack in Minsk subway, etc. – are described from two viewpoints: the first one shows how they are interpreted by the state propaganda machine, the other presents information taken from independent mass media and blogs. The second issue of the graphic novel “The Convincing Victory: two stories on what really happened” was designed with help of Joshua Rowe, Gulnara Nasyrova, Olga Kopenkina and Tobias Weihmann.